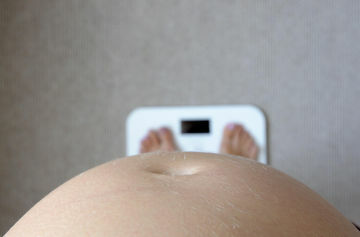 Your weight might affect your baby's weight in unexpected ways. You might think the weight you gain during pregnancy is of little consequence. You may tell yourself you can worry about it after you've given birth or that every pregnancy is different and you may gain more weight than others during this time. But here's the harsh reality: Gaining more weight during your pregnancy than your doctor recommends could have some unfortunate repurcussions you may not have considered. According to new research, women who gain extra pounds or develop diabetes during pregnancy have greater odds of giving birth children who go on to be obese. Previous research has identified a link between excess pregnancy weight gain and overweight newborns, but this research indicates that even children who start off as healthy weight infants are at risk for weight gain later in life. Researchers observed over 13,000 babies, all of whom started as normal weight babies. About 49 percent of the babies became overweight between ages 2 and 10 and 29 percent were obese. Researchers found that the children were 29 times more likely to be obese by age ten when their mothers had diabetes during pregnancy. They had a 16 percent increased chance of becoming obese when their mothers gained over 40 pounds during pregnancy. "It is a common belief that all normal weight babies have the same risk of becoming obese as children and adults," lead study author Teresa Hillier, M.D., told Fox News. "This study shows that that isn't true." According to Hiller, when pregnant women gain a lot of weight or develop diabetes, it can cause a process called "obesity imprinting," which can alter a fetus's metabolism. So what can you do to avoid this issue? Know how much weight you should gain—women of average pre-pregnancy weight should gain 25 to 35 pounds during pregnancy, underweight women 28 to 40 pounds and overweight women 15 to 25 pounds—and stick to healthy eating and exercising (when you can).